If you’re still looking for a weekend getaway with the family this summer, why not head to the White Mountains of Arizona. This gives you a chance to escape the Valley heat and check out some familiar places. 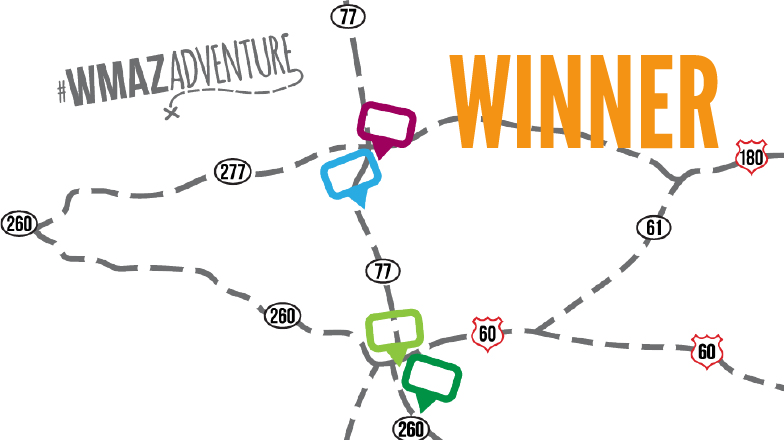 If you haven’t ever been to the area, the White Mountains Arizona Adventure scavenger hunt can help you and the family visit some can’t miss spots. “I was getting ready to go up there with my boyfriend and saw an ad and thought this might be something fun to do up in that area,” said Glendale, resident Janal Pauley. Pauley and her boyfriend downloaded the free phone app based scavenger hunt on a recent trip to the area. The White Mountains Partnership thought this would be a fun and creative way to get people to this part of the state. The nonprofit tourism organization is made up of Show Low, Snowflake, Taylor, Navajo County, Summit Healthcare and the White Mountain Apache Tribe. The scavenger hunt gave people the chance to check in at six different locations. Some of those places included the statue of the game that named Show Low, Stock Up Feed & Tack Store in Taylor and the Snowflake Celebrations restaurant. “I don’t think I’ve actually even visited the statue in Show Low and that was kind of a neat thing to see,” Pauley said. Once you got to each area the app automatically checked you in and then you had the opportunity to take photos and upload them to Instagram and tag #wmazadventure or share through the Say Hi button on the app. “The way that they were [locations] spread out across the region kind of gave you the opportunity to see different areas,” Pauley said. Pauley said she and her boyfriend were able to visit three locations on Saturday and the rest were on Sunday. “I think it’s important to know the heritage of a place you’re visiting and understand how that is developed,” Pauley said. The scavenger hunt not only gave people like Pauley a chance to see new places and a history lesson in each town, checking in at all six locations entered her into a drawing for some cool prizes. Pauley ended up winning the Outdoor Adventure package giving her chance to come back and camp, fish and ride horses.